Wideband Oxygen sensors (which may also be called Wide Range Air Fuel (WRAF) sensors) and Air/Fuel (A/F) Sensors, are replacing conventional oxygen sensors in many late model vehicles. A wideband O2 sensor or A/F sensor is essentially a smarter oxygen sensor with some additional internal circuitry that allows it to precisely determine the exact air/fuel ratio of the engine. Like an ordinary oxygen sensor, it reacts to changing oxygen levels in the exhaust. But unlike an ordinary oxygen sensor, the output signal from a wideband O2 sensor or A/F sensor does not change abruptly when the air/fuel mixture goes rich or lean. This makes it better suited to today's low emission engines, and also for tuning performance engines. An ordinary oxygen sensor is really more of a rich/lean indicator because its output voltage jumps up to 0.8 to 0.9 volts when the air/fuel mixture is rich, and drops to 0.3 volts or less when the air/fuel mixture is lean. By comparison, a wideband O2 sensor or A/F sensor provides a gradually changing current signal that corresponds to the exact air/fuel ratio. Another difference is that the sensor's output voltage is converted by its internal circuitry into a variable current signal that can travel in one of two directions (positive or negative). The current signal gradually increases in the positive direction when the air/fuel mixture becomes leaner. At the "stoichiometric" point when the air/fuel mixture is perfectly balanced (14.7 to 1), which is also referred to as "Lambda", the current flow from the sensor stops and there is no current flow in either direction. And when the air/fuel ratio becomes progressively richer, the current reverses course and flows in the negative direction. The PCM sends a control reference voltage (typically 3.3 volts on Toyota A/F sensor applications, 2.6 volts on Bosch and GM wideband sensors) to the sensor through one pair of wires, and monitors the sensor's output current through a second set of wires. The sensor's output signal is then processed by the PCM, and can be read on a scan tool as the air/fuel ratio, a fuel trim value and/or a voltage value depending on the application and the display capabilities of the scan tool. For applications that display a voltage value, anything less than the reference voltage indicate a rich air/fuel ratio while voltages above the reference voltage indicates a lean air/fuel ratio. On some of the early Toyota OBD II applications, the PCM converts the A/F sensor voltage to look like that of an ordinary oxygen sensor (this was done to comply with the display requirements of early OBD II regulations). Internally, wideband O2 sensors and A/F sensors appear to be similar to conventional zirconia planar oxygen sensors. There is a flat ceramic strip inside the protective metal nose cone on the end of the sensor. The ceramic strip is actually a dual sensing element that combines a "Nerst effect" oxygen pump and "diffusion gap" with the oxygen sensing element. All three are laminated on the same strip of ceramic. Exhaust gas enters the sensor through vents or holes in the metal shroud over the tip of the sensor and reacts with the dual sensor element. Oxygen diffuses through the ceramic substrate on the sensor element. The reaction causes the Nerst cell to generate a voltage just like an ordinary oxygen sensor. The oxygen pump compares the change in voltage to the control voltage from the PCM, and balances one against the other to maintain an internal oxygen balance. This alters the current flow through the sensor creating a positive or negative current signal that indicates the exact air/fuel ratio of the engine. The current flow is not much, usually only about 0.020 amps or less. The PCM then converts the sensor's analog current output into a voltage signal that can then be read on your scan tool. What's the difference between a wideband O2 sensor and an A/F sensor? Wideband 2 sensors typically have 5 wires while most A/F sensors have 4 wires. Like ordinary oxygen sensors, wideband O2 sensors and A/F sensors also have an internal heater circuit to help them reach operating temperature quickly. To work properly, wideband and A/F sensors require a higher operating temperature: 1292 to 1472 degrees F versus about 600 degrees F for ordinary oxygen sensors. Consequently, if the heater circuit fails, the sensor may not put out a reliable signal. The heater circuit is energized through a relay, which turns on when the engine is cranked and the fuel injection relay is energized. The heater circuit can pull up to 8 amps on some engines, and is usually pulse width modulated (PWM) to vary the amount of heat depending on engine temperature (this also prevents the heater from getting too hot and burning out). When the engine is cold, the duty ratio (on time) of the heater circuit will be higher than when the engine is hot. A failure in the heater circuit will usually turn on the Malfunction Indicator Lamp (MIL) and set a P0125 diagnostic trouble code (DTC). Like ordinary oxygen sensors, wideband O2 sensors and A/F sensors are vulnerable to contamination and aging. They can become sluggish and slow to respond to changes in the air/fuel mixture as contaminants build up on the sensor element. Contaminants include phosphorus from motor oil (from worn valve guides and rings), silicates from antifreeze (leaky head gasket or intake gaskets, or cracks in the combustion chamber that leak coolant), and even sulfur and other additives in gasoline. The sensors are designed to last upwards of 150,000 miles but may not go the distance if the engine burns oil, develops an internal coolant leak or gets some bad gas. Wideband 2 sensors and A/F sensors can also be fooled by air leaks in the exhaust system (leaky exhaust manifold gaskets) or compression problems (such as leaky or burned exhaust valves) that allow unburned air to pass through the engine and enter the exhaust. As a rule, the OBD II system will detect any problems that affect the operation of the oxygen or A/F sensors and set a DTC that corresponds to the type of fault. Generic OBD II codes that indicate a fault in the O2 or A/F sensor heater circuit include: P0036, P0037, P0038, P0042, P0043, P0044, P0050, P0051, P0052, P0056, P0057, P0058, P0062, P0063, P0064. Codes that indicate a possible fault in the oxygen sensor itself include any code from P0130 to P0167. There may be additional OEM "enhanced "P1" codes that will vary depending on the year, make and model of the vehicle. The symptoms of a bad wideband O2 sensor or A/F sensor are essentially the same as those of a conventional oxygen sensor: Engine running rich, poor fuel economy and/or an emission failure due to higher than normal levels of carbon monoxide (CO) in the exhaust. Possible causes in addition to the sensor itself having failed include bad wiring connections or a faulty heater circuit relay (if there are heater codes), or a wiring fault, leaky exhaust manifold gasket or leaky exhaust valves if there are sensor codes indicating a lean fuel condition. What to Check: How the sensor responds to changes in the air/fuel ratio. Plug a scan tool into the vehicle diagnostic connector, start the engine and create a momentary change in the air/fuel radio by snapping the throttle or feeding propane into the throttle body. Look for a response from the wideband O2 sensor or A/F sensor. No change in the indicated air/fuel ratio, Lambda value, sensor voltage value or short term fuel trim number would indicate a bad sensor that needs to be replaced. Other scan tool PIDS to look at include the OBD II oxygen heater monitor status, OBD II oxygen sensor monitor status, loop status and coolant temperature. The status of the monitors will tell you if the OBD II system has run its self-checks on the sensor. The loop status will tell you if the PCM is using the wideband O2 or A/F sensor's input to control the air/fuel ratio. If the system remains in open loop once the engine is warm, check for a possible faulty coolant sensor. Another way to check the output of a wideband O2 sensor or A/F sensor is to connect a digital voltmeter or graphing multimeter in series with the sensor's voltage reference line (refer to a wiring diagram for the proper connection). Connect the black negative lead to the sensor end of the reference wire, and the red positive lead to the PCM end of the wire. The meter should then show an increase in voltage (above the reference voltage) if the air/fuel mixture is lean, or a drop in voltage (below the reference voltage) if the mixture is rich. The output of a wideband O2 sensor or A/F sensor can also be observed on a digital storage oscilloscope by connecting one lead to the reference circuit and the other to the sensor control circuit. This will generate a waveform that changes with the air/fuel ratio. The scope can also be connected to the sensor's heater wires to check the duty cycle of the heater circuit. You should see a square wave pattern and a decrease in the duty cycle as the engine warms up. 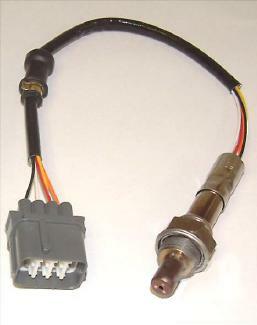 * On Honda 5-wire "Lean Air Fuel" (LAF) sensors, the 8-pin connector pin for the sensor contains a special "calibration" resistor. The value of the resistor can be determined by measuring between terminals 3 and 4 with an ohmmeter, and will be 2.4K ohms, 10K ohms or 15k ohms depending on the application. If the connector is damaged and must be replaced, the replacement must have the same value as the original. The reference voltage from the PCM to the sensor on these engines is 2.7 volts. * Saturn also uses a special trim resistor in their wideband O2 sensor connector (pins 1 & 6). The resistor is typically 30 to 300 ohms. The PCM supplied reference voltage is 2.4 to 2.6 volts. * If a O2 sensor, wideband O2 sensor or A/F sensor has failed because of coolant contamination, do not replace the sensor until the leaky head gasket or cylinder head has been replaced. The new sensor will soon fail unless the coolant leak is fixed.